Interested candidates must be participate physical and written test for Police SI posts. Interested candidates must be participate physical test their own division/range. 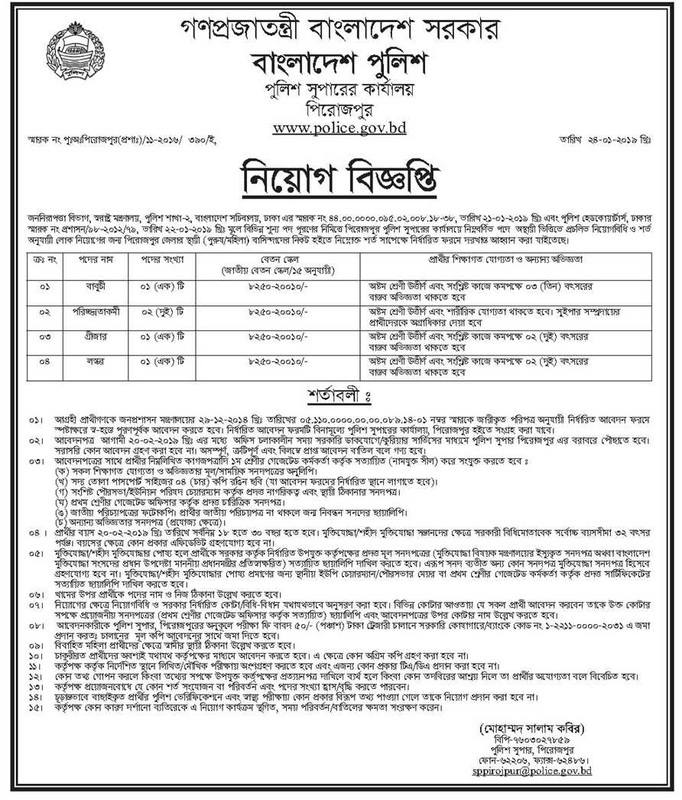 Physical test for Sub-Inspector post will be held in Dhaka, Mymensingh, Chittagong, Sylhet, Rajshahi, Rangpur, Khulna & Barishal Division/rang on 28-30 April 2019 at 09:00am. Selected candidates of primary physical test must be collect application form from DIG. Applicants must be submit application form along with all documents before 07 May 2019 depending your location. Physical test selected candidates will get application form and they can appeared written exam. Written exam will be held on 16-18 June 2019 at 10:00am. Written exam selected candidates can participate oral test. Candidates will be send application form along with attested 02 or 03 copy passport size photographs, citizenship certificate, all educational certificate. Applicants also be attached 100/- or 50/- taka treasury chalan copy with application. Application form must be reached to the Commandant, Police training Center, Tangail before 31 January 2019. Application form must be reached to the Police Super, Police Super Office, Barahmmanbaria before 30 January 2019. Original copy of all certificate and documents will be show during oral test. See detail circular from below attached file. Physical test for Trainee Recruit Constable post will be held in Dhaka, Mymensingh, Chittagong, Sylhet, Rajshahi, Rangpur, Khulna & Barishal Division/rang on 22 February - 06 March 2018 at 09:00am in own district. Details Circular file is included in the Attachment below. Read this and then take preperation. Can any body's tell me when Bangladesh police constable job circular has been given? It is easy too seek job.